Check here for opportunities to purchase MacDonald Ranches cattle and genetics. 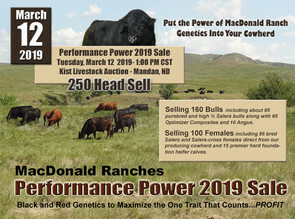 This is the place to find information about our annual Performance Power sale offering, cattle in consignment sales like the Salers Supreme and National Salers sale and even cattle for sale by private treaty. Click here to see more information on the 2019 Genetic Partners Salers Influence Commercial Female Sale.